Lazy choice or back by popular demand after one track aired in last round? Probably a bit of both, spurred on by Nick reminding everyone he was still in short trousers when it came out. After my turning point/guilty displeasure/downer on ‘Green’ many rounds back, I almost felt obliged to bring along the album which made me think R.E.M. were the most important band in the world when they released their 4th album in 1986. Perhaps care free living and youth, adds rose-tinted memories to how I remember this sounding, but it stills sounds great to me today. Its the album I wanted them to make after the awkwardness of ‘Fables of the Reconstruction’ and they pulled it off magnificently. Everything points to increased confidence in playing and Stipe’s vocals coming far more to the front of the sound. You start to get inklings into what an amazing vocalist he could be as he is not afraid to almost carry whole tracks with his voice. They can rock out subversively, ‘Begin the begin’, ‘These days’ and ‘Just a touch’. Go quirky, ‘Underneath the bunker’ and ‘Superman’. Get sentimental and sensitive with much of the rest of the album. In retrospect it does sounds somewhat stereotypically ‘jangle-pop’, but there is still so much variety and content bursting out it ticks so many boxes for me. I wasn’t worried about how influential they probably were, as at the time I just wanted another album by them. Thankfully with ‘Document’ they delivered one last piece of glory. 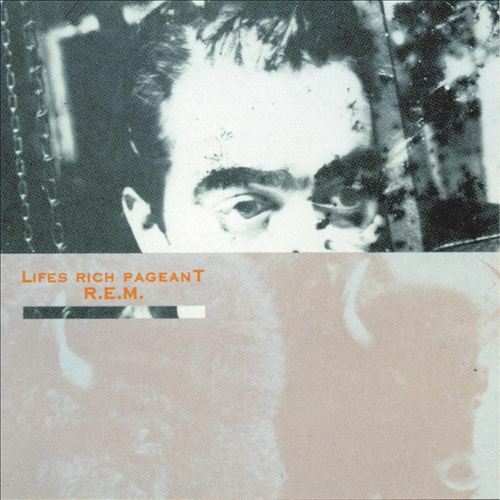 Rob listened: ‘Green’ was my first REM record and I stepped back to ‘Pageant’ after spending a lot of time with the two albums which followed it. So for me it represents a warming and loosening of the hard-edged bite of ‘Finest Worksong’, the machine-tooled melody of ‘Exhuming McCarthy’ and the breathtakingly confident nouveau-pop of ‘Stand’. So, I loved it. ‘Begin the Begin’, ‘These Days’ and ‘Fall On Me’ seem about as good a way to start a record as I can imagine. ‘Swan Swan H’ and ‘Superman’ are pretty much perfect closers. All the stuff that goes in between is almost as good. Tom Listened: Green was also my point of entry into REM’s work and I too worked back from there but, despite now owning all bar Document of REM’s first six albums, Green is the only one I’ve actually purchased. I guess that says something about my feelings for them – I like them…a lot…but they have never quite set my world alight in the way some other bands have. The closest they have come to this is on Life’s Rich Pageant. As I stated in my comment last time, I listened to it a lot at uni but must have lost the cassette it was on because I literally hadn’t heard it for 20+ years. For some reason, since we’ve been doing this thing and I’ve been going back through my collection in search of nuggets from my past, those records that have led to the greatest disappointment have usually been the ones I enjoyed most at the time. Maybe I was just after something different from music way back when; maybe it’s that I now feel I’ve worked the records out and there’s nothing left to discover from them; maybe they were records that ‘fitted in’ better with the time they were released and so have aged less well…I don’t know. As a result I was intrigued to hear LRP – I recall it being wonderful, bright and breezy, a bit rootsier/folkier than what was to come later and a bit poppier and less obtuse than what came before. It still sounded fantastic and I am very grateful to Graham who passed on his spare copy to me…it’s gone to a good home! Nick listened: I’d not heard this before, because I was seven when it came out, and, y’know, you can’t go back and hear everything. Unlike everyone else around the table, Automatic for the People was my first contact with REM, which means my perception of them as a band is very different indeed to Graham’s, Tom’s, and Rob’s. I quite enjoyed this; it was surprisingly muscular, and not very jangle-pop (I gather they were mean to be quite jangle-pop very early on?). Every time the other guys talk about REM I have to clarify the timeline, and where in their catalogue whatever record they’re discussing falls, because I seem to have some kind of blindspot there. They’ll never be my band, but that’s fine.